Things are starting to really heat up now and that means so many chances to entertain outside. Some favorite spots include the beach, in a pool cabana and in Central Park... all of which can get rather heated and sticky. 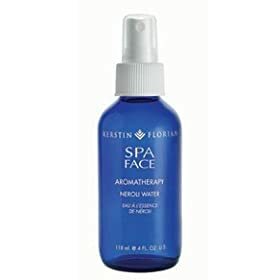 Recently a new product created out of a very old luxury has made its debut just in time, Kerstin Florian Aromatherapy Neroli Water, $35. Created out of natural bitter orange blossom water (aka Neroli) and not much else this easily becomes addictive and a replacement for alcohol based scents during summer. A must for anyone spending time out in the sun as alcohols can amplify sunburn. Non! Cooling and very pungent in a va-va-voom burst of sweetness it's perfect for refreshing yourself throughout the day and, even more so, in the evening. Rather quick to dissipate, which keeps the risk of cloying you to death to a minimum. As for the happiness? Neroli has long been hailed as causing euphoria, so I'll stock up on a couple more bottles thank you very much.